MLB 2017 Postseason: Need a Rooting Interest? 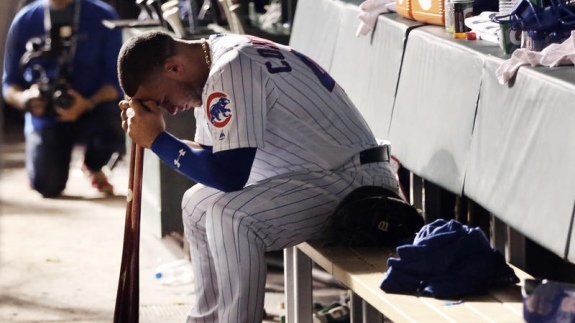 Catcher Willson Contreras hangs his head following the Chicago Cubs' 2-1 defeat to the Colorado Rockies during the 2018 National League Wild Card Game. Winning 95 regular season games was not enough to secure the National League Central Division title. Scoring one run an Anthony Rizzo solo home run was not enough to win the National League tiebreaker game against the Milwaukee Brewers. Driving home one run in 13 innings was not enough to defeat the Colorado Rockies in the NL Wild Card Game at Wrigley Field. After the Chicago Cubs fell to the Rockies, 2-1, all dreams of returning to the World Series came to an abrupt end. With runners on second and third and no outs, Nolan Arenado hit a sacrifice fly to deep right-center field that sent Charlie Blackmon home. The Rockies survived a two-out Cubs rally in the bottom of the seventh inning when the North Siders loaded the bases, but pinch-hitter Jason Heyward struck out. Until the bottom of the eighth inning, the Rockies mustered all of the offense they needed. After Cubs first baseman Anthony Rizzo hit a two-out single in the bottom of the eighth, pinch-running specialist Terrance Gore entered the game. He promptly swiped second base. NL MVP candidate, Javier Baez, doubled to center field and plated Gore. The Cubs knotted the score at 1-1. The 2016 Cubs had a knack for capitalizing on moments like this. But this year's team had a season-long problem. During the 2018 regular season, the Cubs scored one or fewer runs in 39 games. That equates to approximately one-quarter of their games (23.93% in 163 games). Only the Baltimore Orioles, the worst team in baseball with 115 losses, had more. The Orioles accomplished that feat in 40 games. For what it's worth, the Rockies were only limited to one or fewer runs during 14 regular season contests (8.59% in 163 games). Despite the lack of offense, starting pitcher Jon Lester kept the Rockies at bay. Through six innings pitched, he fanned nine batters, scattered four hits and allowed just one run. Manager Joe Maddon sent nine different hurlers to the mound including two additional starting pitchers. Cole Hamels, a mid-season acquisition, tossed two scoreless frames. Kyle Hendricks, the starter of the 2016 pennant-winning game against the Los Angeles Dodgers, logged one-and-a-third innings. Hendricks suffered the loss after surrendering three hits including a single to Tony Wolters that drove home the game-winning run. Following the Cubs' truncated postseason run, fans may find solace in numbers generated during Maddon's era at the helm. After joining the franchise in 2015, the Cubs reached the National League Championship Series (NLCS) in three consecutive seasons (2015-2017). Of course, 2016 ended the legendary 108-year title drought by defeating the Cleveland Indians in the Fall Classic. The Maddon-led Cubs have amassed 387 regular season wins (.597). That is eight more than the Dodgers and a baker's dozen more than the Houston Astros. Here's to 2019 and a return to form.